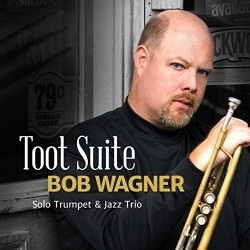 With this release of "Toot Suite," available from all major on-line music retailers, trumpeter Bob Wagner becomes the first American-born musician to record this widely-heard but rarely-recorded suite for trumpet and jazz trio in its entirety. Philadelphia, PA, February 16, 2018 --(PR.com)-- Jump City Music is thrilled to announce the release of the debut solo album from trumpeter Bob Wagner. Toot Suite will be available in physical form and as a digital download from Wagner's website as well as all major digital music distribution platforms (iTunes, Amazon, etc.). Listen to a clip from Allegre, the opening movement from Bob Wagner's Toot Suite. Starts with baroque style duet between the trumpet and piano and at the 40 sec mark jumps into a lively jazz-waltz.